ARTIE – A programmable ‘egg’ to help a child calm down. Neuro Trainer – VR Cognitive Trainer. The Kombucha Project – Craft Kombucha from Santa Fe. BruxRelief – A wearable device to help with Teeth Grinding. TakeStep – An app to aid in patient recovery. SANESuite – Helping survivors of trauma tell their stories. ABQid will also have an open house on December 8th at the their new location. In other Health and Wellness news. The Arrowhead Center at NMSU is starting off a HealthSprint for their next program. It is a 5 month program around Digital Health. Applications close on December 10th and you don’t have to be in Las Cruces to apply. I spent some time shooting off e-mails to all the legislatures who are in contested elections this November with a link to my previous blog post about the issues with Tesla in New Mexico and a question about whether they would support a change. I was happy to get such great responses and conversations with so many, although the response rate is quite low. If you are on the fence about a candidate in your district, maybe see if they support changing the state laws so that Tesla can service and sell vehicles here. I will update this list as I get more responses (sorry the formatting isn’t great). Full Disclosure: I am a Tesla stockholder, have a reservation for upcoming Tesla Model 3, and am an Elon Musk fanboy. I have no inside knowledge of Tesla’s plans or desires in New Mexico and anything I state is speculation based on publicly available information. State laws change constantly so references to other states’ laws may be outdated. This section prevents car manufactures from selling directly to consumers or servicing vehicles. Tesla is the most well know company using a direct to consumer approach for their vehicles for sales and service. In practice this law means anyone who wants to buy a Tesla must do so online and have it delivered and go to Colorado if they want a test drive. It also means if they want their Tesla serviced it must be towed or brought to Colorado. This law puts undo hardship on New Mexicans who want to own a Tesla vehicle. It is also placing a negative perception on New Mexico, preventing the collection of GRT taxes, and we are losing out on jobs. This law should be modified to fix these issues. As stated above, this law simply hurts New Mexicans who want to own Teslas or other vehicles by manufactures following Tesla’s direct to consumer approach. While the number of New Mexican’s that own a Tesla is small now, with the future release of the Model 3 the numbers will grow. New Mexico and Albuquerque have invested a lot of money, time and effort into the startup, tech and entrepreneur community. The goal is to increase the amount of local startups, but there is no denying that it cannot all be done locally and we want to attract money, talent and companies to New Mexico. Tesla is a popular vehicle with the demographics we most want to attract and while this probably wouldn’t be a deciding factor is someone coming to New Mexico, it certainly could hurt those on the fence. Can you imagine considering taking a job in another state and then learning that you would have to tow your vehicle to another state if it needs service? How much better would the opportunity need to be in order to take that job? Some states, like those on the east coast and Texas can get away with laws like this and have it notched up to politics. New Mexico doesn’t have that luxury. Laws like this reinforce existing perception of New Mexico being backwards and corrupt. Having a legislature and government that updates these laws, like with the ride sharing laws passed this year, help show that we are a state that is responsive to disruptive technologies and willing to work with companies that are changing the paradigm. This can only help attract new companies and entrepreneurs to New Mexico. Given the labs, our history, and our environment, New Mexico should be looked at as a leader in high tech development, solar technology and renewables. I hope one day this is the prevailing perception and reputation of New Mexico. Supporting companies like Tesla will only help (especially if we are one of the earlier states and not a late follower). For several years now Tesla has had a service center marked as “coming soon” to Albuquerque. This law is obviously preventing them from building the service center and it probably won’t be long before service center is built if this law is changed. A simple law change will bring in permanent jobs at the service center and construction jobs building it. It will also increase property taxes and GRT taxes that are currently being lost to Colorado at a time when the are desperately needed. Tesla hasn’t pressed the issue here, likely because it is a small market, but in addition to the service center one could imagine Tesla building stores in Albuquerque, Santa Fe and Las Cruces, especially with Arizona and Texas currently banning sales. If we act now, instead of losing money to Colorado, we could gaining from people coming in from Arizona and Texas. Tesla has looked at New Mexico in the past for their factories. Most recently with the Gigafactory, but also back in 2007 for their original factory before they eventually went with the Fremont factory. This gives reason to believe that New Mexico will continue to be considered in the future. In addition to future battery or vehicle production, SolarCity will be combined with Tesla and may need additional factories. Elon Musk’s other company, Space X, will need construction facilities for the many components that go into building their new rockets and spaceship before final assembly in Florida. With our space history, attempts at building a space industry, and Musk’s previous interest in New Mexico it is easy to imagine New Mexico being considered for future development. It is likely that his law will have little affect on future decisions, with those decisions being primarily financial. However, if we are one of the supportive states for Tesla it certainly can’t hurt our chances and there would be one potential hurdle off the table. Can you imagine winning a factory or other key industry over a state like Texas? The simples, fairest and most effective way would be to strike part V from the law. This would allow Tesla and other companies to enter the New Mexico market. At the very least we should strike the ‘service center’ provision to the law. Not being able to buy a vehicle in state is a one time annoyance, but not being able to service it is a consistent issue for owners. We could also do what other states, such as Ohio, Connecticut and Maryland have done and carve out a fairly targeted exception towards Tesla. They allow electric car companies without a physical presence to open up to three dealerships (or some other number depending in the state). My daughter calls rubber…Ninja Flex. No that is not a cute name she came up with, but a type of flexible filament for 3D printers. When I heard this it solidified by decision that I had to get a 3D printer. At six she has every expectation that she can make anything she wants on a 3D printer, an expectation that is only slightly unreasonable. It is also an expectation that I want to support. When we have down time we watch James Bruton and other YouTube makers come up with incredible creations using their 3D printers. 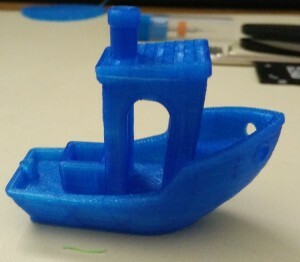 We also have access to a 3D printer at Quelab and have done some printing there. Unfortunately, it isn’t practical for me to spend the type of time at Quelab to do the experimenting I want. We also don’t have the time to stay there and watch the huge backlog of prints I want to do (my son has a backlog of 3D prints to do as well). So I finally bought one. As much as I wanted a Taz 6, I just couldn’t justify the cost, but when the Monoprice Maker Select went on sale I jumped on it based on the great reviews. Once I got it I was able to set it up and had it doing test prints in less than an hour. I ended up with version 2.1 and most beginner information is targeted at the v2.0. Not a big deal, but a lot of the essential improvements aren’t applicable anymore. I am learning a ton about why people put so many mods into their printer. 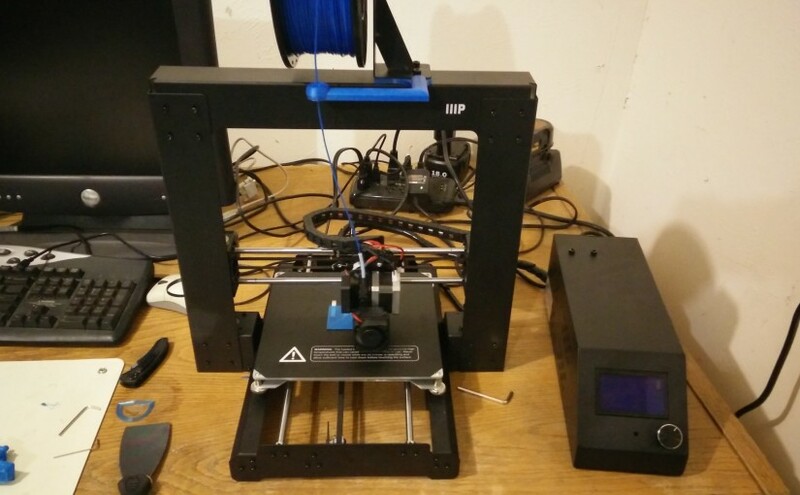 It is based on a standard printer, the Wanhao Duplicator I3 so there is a lot of community support for it. I’ll probably spend any blogging time in the immediate future going over the mods I put into it, but even right out of the box it was working great. 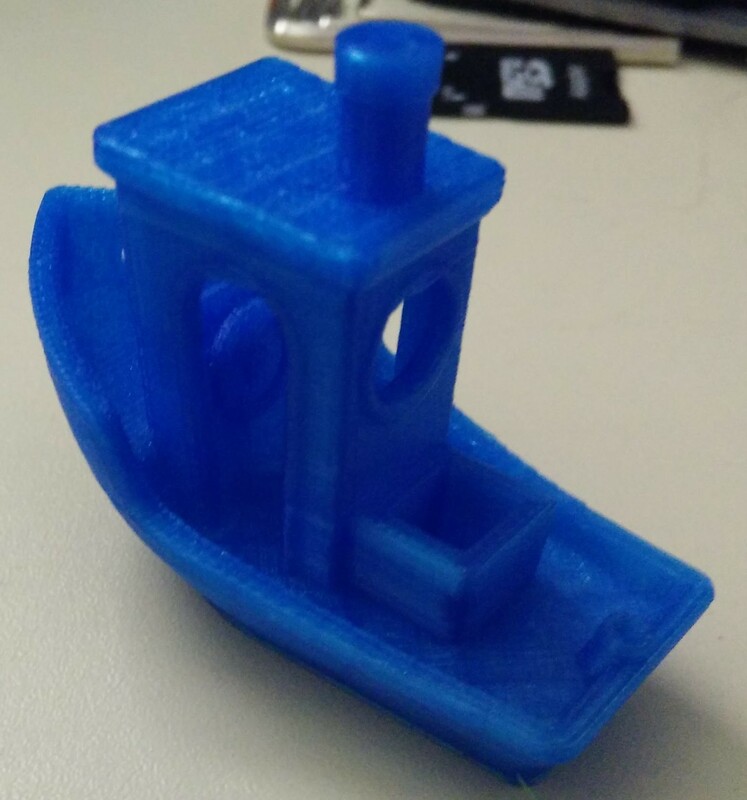 This is Benchy, a popular calibration print and I think it came out great, way better than expected, based on my experience with other cheap printers. 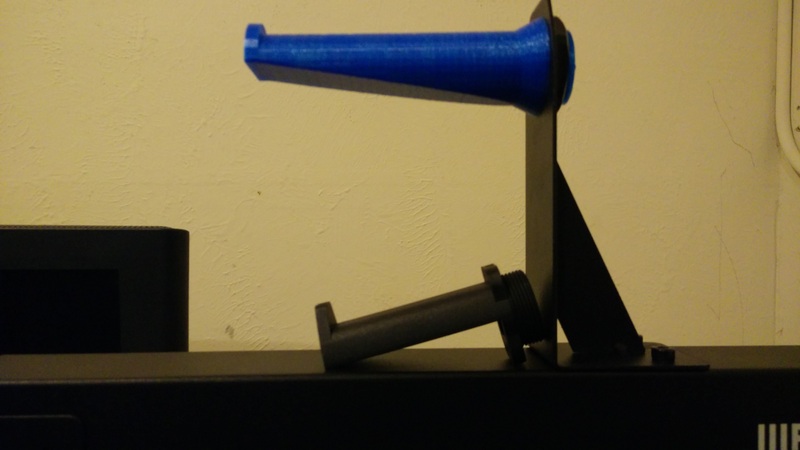 The one huge problem out of the box, in the v2.1 ships with a small filament holder. It is too short to hold the standard 1kg spools, so my first prints involved constantly babysitting it. The first essential mod for this a new spool holder. The original one is beneath it so you can see how short it was. Locking nuts – either printed into a new thumb screw or just added to the bottom. This prevents the thumb screws from moving. New Y-carriage – The one on it now is thin and will warp from the heat, making leveling harder. I’ll do the first two sometime soon, then setup a Raspberry Pi 3 with Octoprint, then I will have to see where I want to go next. There are tons of improvements that can be made so I will just have to see what it still bugging me. For a introduction to the system Nery’s Youtube channel is great, he prints on his Marker Select constantly and has videos on all his upgrades. This is a great first video, although not entirely applicable to the v2.1 (he is using a V2.0). Now my backlog of things I want to print has gotten much longer as I print items to make my prints better, but that is just adds more fun! Last Thursday was a full day of checking out local companies and startups. It started with Innovate New Mexico, put on by Albuquerque Business First. 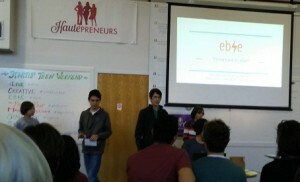 They had a ‘World Fair’ type competition of local startups and gave out several awards at the end. 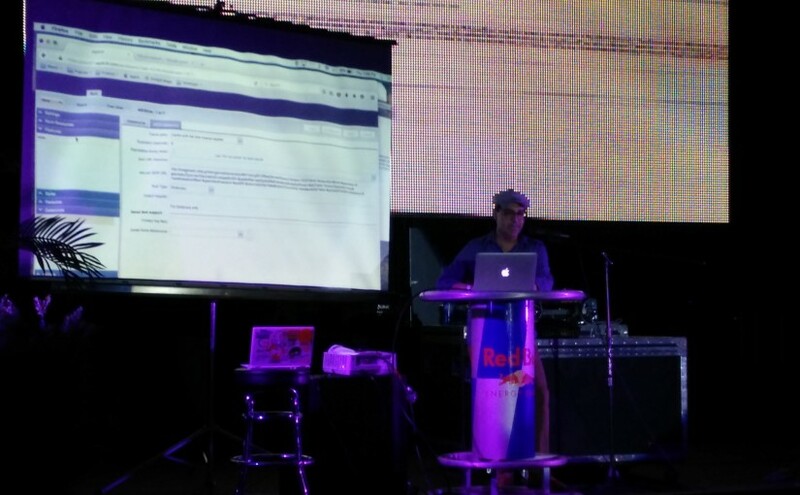 I wasn’t able to attend Innovate New Mexico, but in the evening there was the Tech.Co demo day at El Rey. I was able to attend this fun event and check out local companies presenting their products. Most of the companies have been around at various events, but it was great to get updates on what they were doing and see their software. This event was a little different that others I had been to. In the past the events are usually pitches, but at this event many of the companies got up and gave live demonstrations. 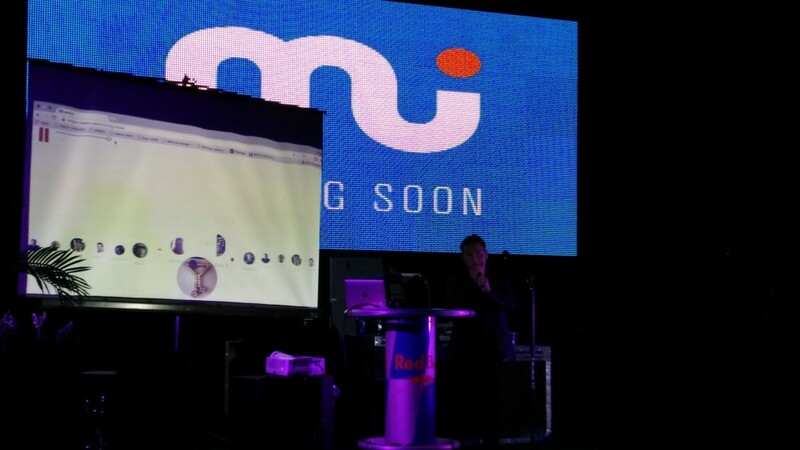 The keynote of the night was Andy Lim (of Lavu) showing off his new company Addmi. I always enjoy supporting and learning about our local entreprenuers. If you are sorry you missed it don’t worry. Mark down August 22nd on your calendar. That will be the next Tech.co event, Startup of the Year Pitch. Follow them on twitter @techcoabq to stay up to date! Local elections are often ignored, but they are also the elections that will have the most impact on your daily life. This primary election is important because for many positions you are actually electing the person that will serve, either because they are running unopposed, or because of the demographics of their district the other party has no chance of winning. I tried to find as much information as I could about the candidates and wrote this up to hopefully save time for others (and myself in the future). As I find more information, I will continue to update it at least until early voting. NM is a closed primary. You must register as a Democrat or Republican in order to vote. You can register or change your party online, but must do it by May 10th. You can also download a sample ballot. Absentee voting starts May 10th and you can vote in person at the Clerk’s Annex location,1500 Lomas Blvd. NW. Early voting across the county starts May 21st. With the ease of online registration/party change I encourage everyone to register Democrat with a few exceptions. You can easily change back to your preferred party if it is not Democrat. The Democratic primary has more contested county and state positions you can vote for. For most people, on the Republican side the only contested primary is county treasurer. You feel strongly about voting for one of the Republican presidential candidates, even though the election is essentially over. You want to vote for one of the Republican candidates for county treasurer. You live in State House District 24 and want to vote in the contested Republican primary. You live in State Senate District 19 and want to vote for one of the four Republican candidates. If you are in Bernalillo County and none of these reasons apply to you, switch your party to Democrat in vote in their primary to have the most impact on the election. You can easily switch back to your preferred party afterwards. I have attempted to list any applicable history for the position, the incumbent, if the winner will face a challenger in the Nov. election, each candidates website, if I can find it, and applicable information. The applicable information is where my bias will come it, as far as what I choose to include or not, but I will try to keep opinions out of it. If you have interviews, questionnaires or other things I can add, let me know in the comments. The PRC is responsible for a significant amount of regulation in NM for public utilities, telecommunications and transportation. There are no other declared candidates for PRC district 1, so the winner of the primary is currently unopposed in the November election. District 1 is most of Albuquerque. ABQ Journal profile. Karen Montoya – Campaign Website, Ballotpedia, incumbent, has served 1 term. The district attorney decides who to prosecute, who not to prosecute, what pleas to offer or not offer, etc. This position seems even more important with the recent issues with APD. How well do they work together with the police force vs. how do they hold the police force accountable. Kari Brandenburg has been the DA for the last 16 years and is not running again, so this will be the first time there will be a new face in the office in a long time. An article by NM Political Report discuss the issue of the DA and APD interaction and provides a sentence from each candidate. Recording of the KUNM discussion with the candidates. ABQ Journal summary of the race. Bernalillo County judge. It doesn’t look like either candidates has served as a judge before. John Duran – Campaign Website, Ballotpedia, incumbent. Served as Judge in Division 8, but lost re-election in 2014. He ran as a Republican in 2014. Maggie Toulouse Oliver has served and the clerk for the last nine years, but is now running for Secretary of State. ABQ Journal summary and update. This is a four way race on the Democratic side and the position has a lot of history. Patrick Padilla served as treasurer from 2005 – 2012 (and 1990-1993). Manny Ortiz served as treasurer from 2013 to the present, he was Padilla’s investment adviser, but then when he won Padilla became his investment adviser. Ortiz and Padilla have been involved in a fight with the county commissioners. The commissioners were worried they didn’t have the cash flow to meet bills because of too many long term investments. The county sold the investments at a huge loss to make sure they had money. The commissioners and treasurer have been on bad terms since with Ortiz suing them all now. Both Ortiz and Padilla are running for the treasurer’s office. ABQ Journal Summary of the race. Manny Ortiz – Campaign Website, incumbent. Patrick Padilla – Unable to find campaign website, has served 12 years as County Treasurer previously. Christopher Sanchez – Campaign Website, accounting manager in the treasurer’s office. I can’t find campaign pages for either of the Republican candidates at this time. The ABQ Journal Summary of the race includes a profile for Kim Hillard. The incumbent Art De La Cruz is not running. There are currently three Democrats and one Republican running for the seat. ABQ Journal profile of the Democratic candidates. Get a sample ballot or look at the Senate and House maps to determine if any of these primaries are applicable to you. House district 21 has a three way Democratic primary. The winner will run unopposed in the November election. The incumbent, Idalia Lechuga-Tena has was appointed in November 2015. ABQ Journal profile of the race. The incumbent is not seeking re-election so the winner of this primary will face the winner of the Democratic primary (above). The winner of the Democratic primary will run unopposed in the November election. ABQ Journal write up of the primary race. House district 69 is a 4 way race for the Democratic primary. There is no incumbent and the winner will run unopposed in the November election. The winner of the democratic primary will run unopposed in November. ABQ Journal Summary of the race. District 19 has a four way Republican primary and will face a Democratic opponent in November. There is no incumbent. ABQ Journal Summary of the race and Edgewood News candidate profiles. Only a small part of the large district 22 is in Bernalillo County. There winner of the Democratic primary will run unopposed in the November election. ABQ Journal Summary of the race. The winner of the Democratic primary will face the Republican incumbent in November. ABQ Journal Summary of the race. Recently I have been using a HC 05 Bluetooth module connected to an Arduino and have found it incredibly useful. You can easily connect it to an Arduino serial port and use Bluetooth to communicate with the Arduino as if it were connected through serial USB to a computer. Most projects and examples have you use the your cell phone because Bluetooth is ubiquitous on them. However, I wanted my daughter to be able to play with my project without monopolizing my phone, so I found the Bluetooth Serial Terminal app. 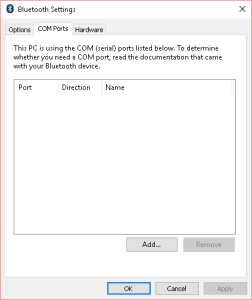 Unfortunately, it has a lot of bad reviews and no instructions, this is because there is a slightly hidden step needed to assign Bluetooth to a com port in Windows 10. I had trouble finding documentation around this, so hopefully this instruction set will help others. 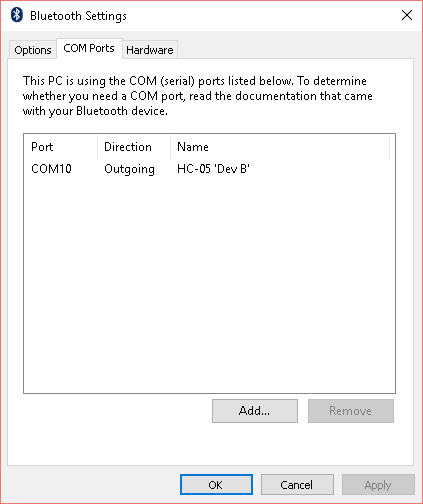 The first step is to pair the HC-05 with your Windows 10 computer. 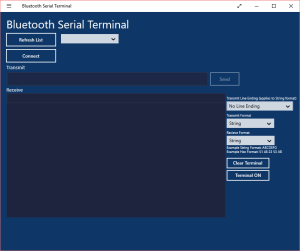 Once it is paired most people open up the Bluetooth Serial Terminal app and find there is nothing to connect to, even though the device is paired. 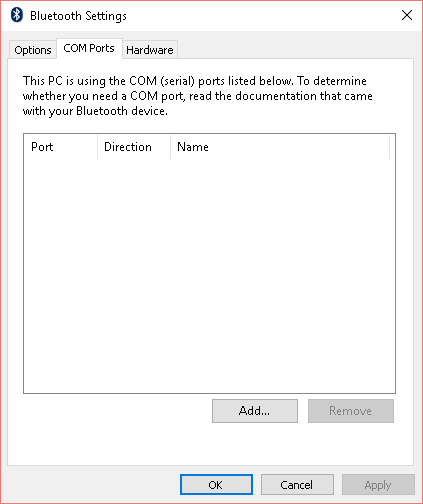 The Bluetooth device needs to be setup to use a COM port. 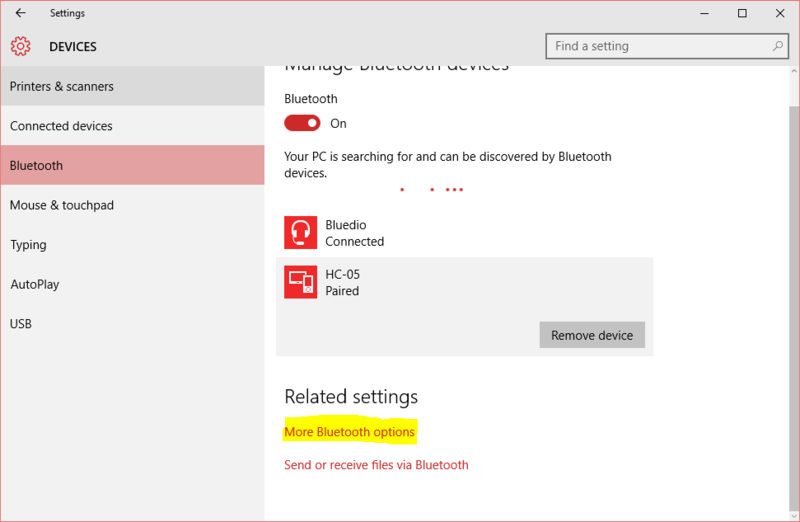 In order to do this open up the Bluetooth settings and press the More Bluetooth Options link at the bottom. In the Bluetooth Settings dialog switch to the COM Ports tab and then press the Add button. 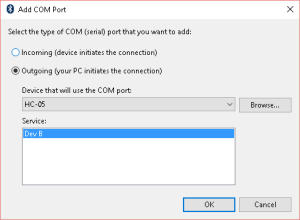 In the Add COM Port dialog select the Outgoing (your PC initiates the connection) radio button. 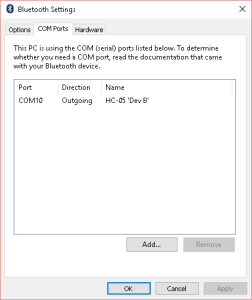 Choose the HC-05 device under Device that will use the COM Port drop down and then click OK. 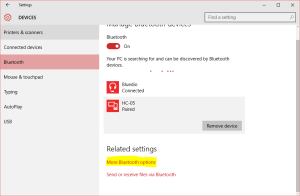 It will assign the device to a COM port, click OK out of the Bluetooth settings. Return to the Bluetooth Serial Terminal app and click on Refresh List. The HC-05 should now appear in the list and the app will allow you to connect to it. Here are a list of startups from the last couple of months for everyone to check out and follow! ConvoBox, @Convobox – Suggestion box targeting feedback from students to schools. HoneyMoon Brewery, @HoneyMoonBrew – Kombucha beer brewing. Patrick’s Fine Sodas, @patrickssodas – Better Soda’s, took 1st at FoodBytes! Summit in San Francisco. Wyrd, @wyrdapp – New ways to discover and share content (they have pivoted since their November Scrappy Startup pitch). Zummit Labs – Exploring the future of mobile commerce. 4D, LLC – Holographic displays. Fresco New Mexico – Food truck. Lobo Cell Phone Solutions – Cell phone repair. Medical Debt Resolutions, LLC – Consulting for medical debt. MyTap Inc. – Beer recommendation engine. Shop for NM Kids – Marketing and fundraising to help New Mexico kids. The CBD Botique – Products with cannabidiol extract. Trail Quail – App for hiking and biking trails. Another Mother Kombucha – Kombucha tea. Cool Nerves Technology – Cooling shirts for medical conditions. Essence de Café – Coffee extract provider. JobPlacer – Connecting freelancers and businesses. Quetzal Co-op – Food truck. Stellate Studio – Tesselation art app. UbiQD – Quantum dot manufacturer. Dig & Serve – Underground, pop-up dinning experiences with local food. BounceChat – Distance based messaging. A bunch of Albuquerque startups went to SXSW again this year. The Sunport blog and Startup Spot with Sonja have some pre SXSW info on attending. While there Cultivating Coders, @CultivatingCoders, won the Tech.Co Startup of the Year award. Check out all these local startup, follow them on social media and try out their products! In other accelerator news, ABQid is accepting applications for their summer cohort until April 22nd and the first Haute CELERATOR program started March 1st, but continues to accept applications. Albuquerque has had several startup weekends over the last couple of year. A startup weekend gives groups of people 72 hours to propose ideas, create teams, refine their idea with prototypes and market research, and then do a 5 minute judge pitch for a chance to win prizes. Teen Startup Weekend is the same idea, but targeted towards teenagers (13 – 18) and with reduced hours. Albuquerque hosted the first Teen Startup Weekend ever three years ago, thanks to the passion of a young woman Taylor Chavez. Check out this video from last year for more information about it. iLive – Interfacing vital monitors with a Fit Bit and software services to monitor the health of our elderly populations. Creative App – A platform for connecting creatives of different types so they can collaborate and publish their work. ebie – A open hardware bike mod to generate electricity while riding. The Perfect Pair – A food website dedicated to finding great food pairings. Magic Melody – A user generated content platform for teaching and learning how to play an instrument. SugarTec – Dissolvable K-Cups to eliminate waste. SnoRock – Ski/Snowboarding boots built out of a brand new high-tech gel. EDGEtheater – Using modern technology to bring back drive in theaters to rural communities. These young men and women were amazing. They stood in front of about hundred people and pitch their creative ideas. They were drilled by the judges for 3 minutes. The judges didn’t hold back, the timing was ruthless, and the crowd was awesome and supportive. These kids just had some really great ideas, I am so proud of them. I was truly amazed at what these teenagers were able to put together and the ideas they had. I am really excited to see if they can take any of these further. The winning teams got time with different judges/coaches to help them with their company (among other prizes). A lot of the startup events and entrepreneurial activities feels rushed, quick, important. We are going to build something now! And that is a lot of fun of it. This event want no different in that aspect, but the long game is empowering our youth. We can send them into the world knowing that they can be their own boss, start their own companies, and turn their ideas into products. I hope this and similar events continue and I picture great things eventually coming out of these events.